Springtime is one of the best times of the year to head out on our local trails. Even with the drought, there is still water in many of the creeks; the wildflowers are blooming; and the scenery can be quite enchanting. Perhaps one of the easier backcountry destinations in our area is Manzana Creek in the San Rafael Wilderness. Manzana Trail is accessed from the trailheads near Nira Campground and follows the creek in both directions. An interesting destination that allows for additional off-trail exploring is Fish Creek. Fish Creek is upstream from Nira along Manzana Trail. Fish Camp, which is near the confluence of Manzana and Fish Creeks, is about 5 miles roundtrip from the trailhead. At the confluence of the two creeks, one can find a swimhole, and upstream, along Fish Creek one can explore the wilderness still further. To get to the trailhead from Santa Barbara, take State Route 154 past Lake Cachuma to Armour Ranch Road. You’ll know if you’ve gone too far if you arrive at the turnoff for State Route 246. Turn right onto Armour Ranch Road and follow it to the beginning of Happy Canyon Road. Turn right onto Happy Canyon Road. The road leads through ranch country before climbing out of the Santa Ynez Valley towards Cachuma Saddle and the top of the San Rafael Mountains. From the 4-way intersection at Cachuma Saddle, continue north. Happy Canyon Road becomes Sunset Valley Road and descends down towards Manzana Creek. The road passes Davy Brown Campground, before ending at Nira Campground. Both campgrounds are shaded and offer campsites on a first come, first serve basis. An adventure pass is required to camp at either campground, but not to park at the trailheads. The drive from Santa Barbara to Nira is about 1.5 hours. 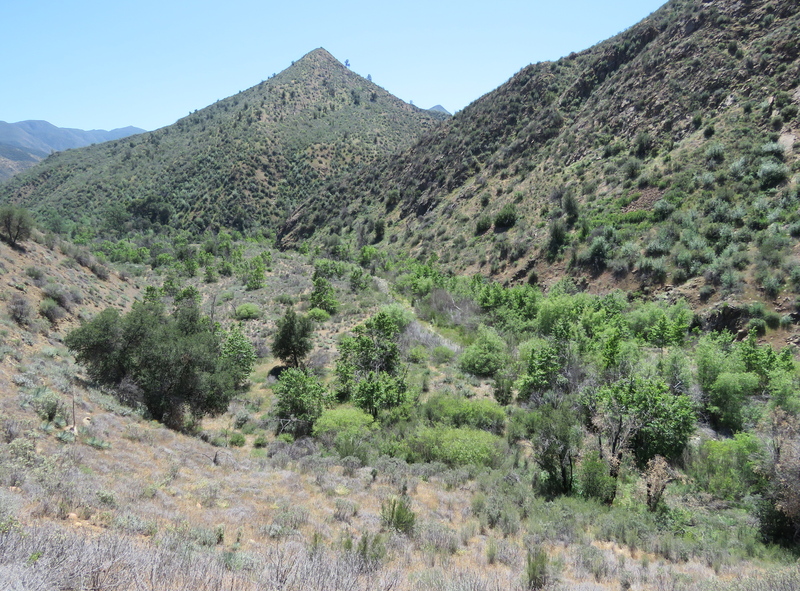 From the trailhead at Nira, Manzana Trail continues upstream and crosses Manzana Creek. The creek is currently flowing intermittently. 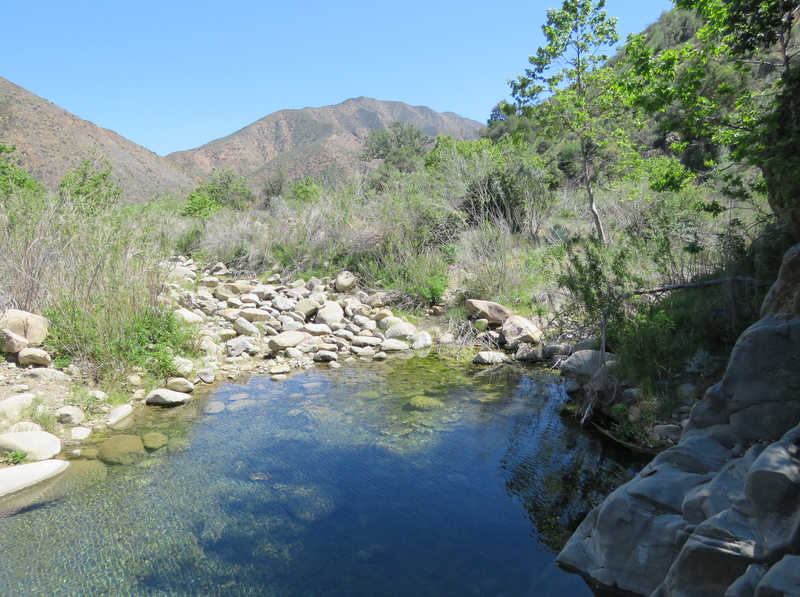 From this first creek crossing, Manzana Trail stays on the north side of the creek until just before Fish Camp, where it crosses the creek a second time. The trail is in generally good condition as it follows Manzana Creek upstream. Near the creek, the trail passes through a mix of riparian and chaparral plants, including sycamore, alder, and willow, as well as coast live oak, ceanothus and manzanita. Along the route, one can also find numerous grey pines that add to the scenery. There are also some wildflowers to be found along the trail, such as larkspur, blue dicks, penstemon, and some lupine. And while the wildflower bloom may be modest, the butterflies are another story altogether. The butterflies seem to have gotten an early start this year, and are currently quite active. Along the trail, one can spot more than a half-dozen different butterflies making voracious use of the wildflowers that are in bloom. Perhaps the most abundant of the butterflies along the trail is checkerspot. 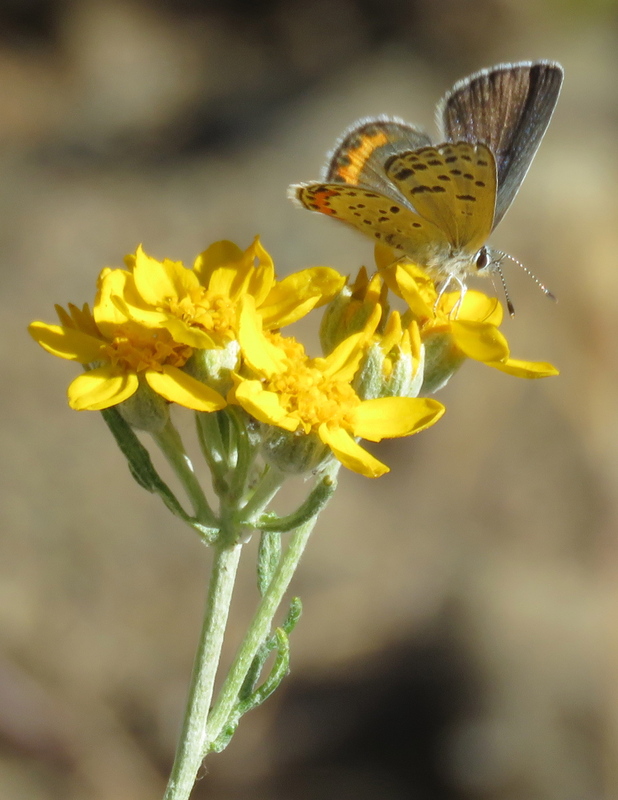 This medium-sized butterfly with its orange, yellow and black pattern can easily be found on purple yerba santa flowers, as well as the other flowers in bloom. Other butterflies in the mix are large swallowtails with their yellow and black pattern, as well as the occasional monarch with its orange and black pattern. Next in size are the somewhat smaller California sister butterflies, which are black with touches of orange and white. Medium to small-sized butterflies along the trail can include: buckeyes, which have distinctive circles or “eyes” as part of their wing pattern; sulphur butterflies with their mostly creamy yellow color; Sara orangetip, which have white wings with orange tips; and checkered whites, which have an overall white or cream color accented with grey. Careful eyes may also spot small blueish butterflies such as acmon and lupine blues, both of which have pale blue undersides that are accented with black and touches of orange. At about the 1-mile mark, Manzana Trail arrives at the beginning of Lost Valley Trail. Lost Valley Trail leads north, away from Manzana Creek. The trail connects over to Lost Valley Creek before eventually making its way to the top of Hurricane Deck. Just past the trail juncture, Manzana Trail arrives at Lost Valley Camp. The camp has two sites situated under the grey pines. Both sites have a picnic table and fire ring, and currently there is water in the creek at the camp. 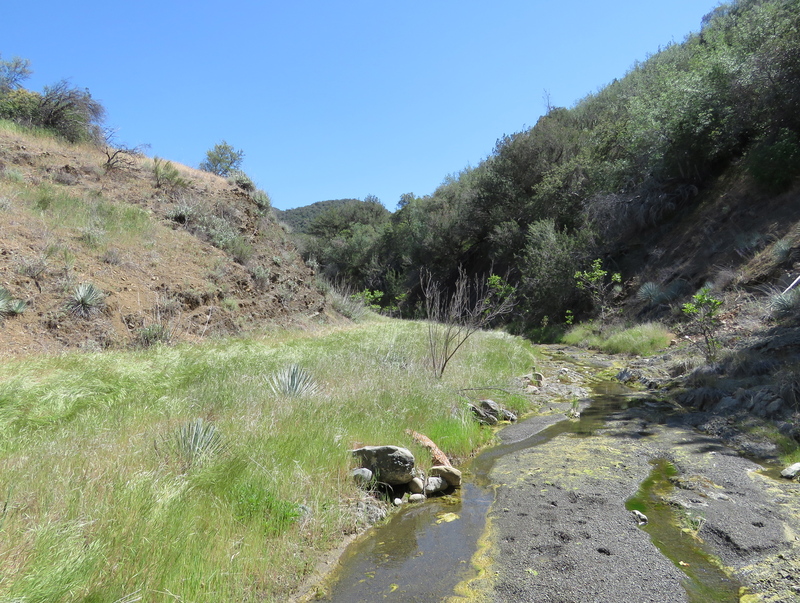 About a half-mile past the camp, Manzana Trail crosses Lost Valley Creek, which is typically dry here. Past the crossing, the trail climbs away from Manzana Creek passing through mostly chaparral and offering views out across the canyon. The trail then descends back down to the creek, crosses it, and arrives at Fish Camp. Currently the crossing is dry, but water can be found just downstream at the confluence of Fish and Manzana Creeks. Fish Camp has two campsites, each with a picnic table and metal fire ring; and one of the features of Fish Camp is the nearby swimhole. When the creeks are flowing a nice pool of water is found at the confluence of Fish and Manzana Creeks. Fish Creek can be explored further by hiking upstream along the creek. There is no designated route, but one can find an informal route along the creek used by hunters and occasional hikers, as well as the local wildlife, that is relatively easy to follow. The canyon is wide enough that there are only few places where one has to navigate through the brush. From the confluence with Manzana Creek, Fish Creek’s meandering course leads southward towards its source in the San Rafael Mountains. The creek is currently flowing along most of its length, and an interesting destination is the small grotto that can be found about a mile upstream from the confluence. In addition to the other plants founds along Manzana Trail, Fish Creek also includes juniper. In fact, early on in the hike, the creek passes a whole hillside covered with California juniper bushes. About a mile from the confluence with Manzana Creek, Fish Creek branches. To the left is East Fork Fish Creek and to the right Fish Creek. Both creeks are currently flowing. From this confluence, hike up the small ridge that separates the two creeks. The informal trail then bears to the right, continuing above Fish Creek a short way, before rejoining the creek just above the grotto. The grotto is formed where Fish Creek has carved through conglomerate stone and has created an almost hidden pool of water. The canyon’s geology represents another interesting aspect of the hike. From Nira, Manzana Trail passes through mostly Cachuma Formation shale. Cachuma Formation material was deposited 100-66 million years ago under the ocean, and then uplifted and eroded over time along with the other layers of sedimentary and metamorphic rocks in the San Rafael Mountains. 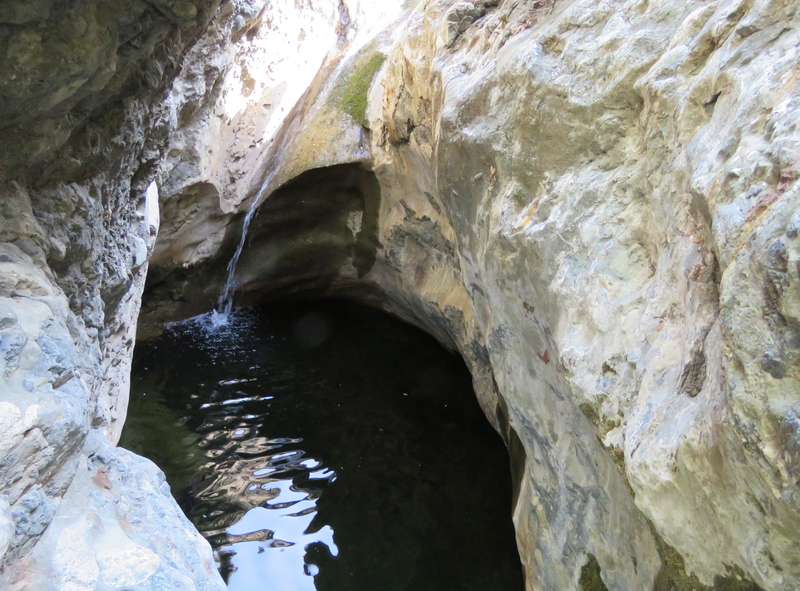 At the mouth of Fish Creek is Cachuma Formation sandstone, which dramatically frames the swimhole. Upstream from the swimhole, Fish Creek passes through Cachuma Formation shale all the way until it transitions to Cachuma Formation conglomerate stone. Conglomerates are sedimentary rocks that contain other rocks that have been cemented together with finer-grained material. The grotto can make a good return point for the hike. Past the grotto one can continue upstream roughly another quarter-mile along mostly conglomerate stone, before the creek starts to become closed in with brush and trees. Regardless of how far you hike you’ll get to explore a unique part of the San Rafael Wilderness. This article originally appeared in the April 21st, 2015 edition of the Santa Barbara News-Press. This article is also the 200th Trail Quest article. I first did this hike with the Sierra Club as one of the outings I joined them on for an article I wrote about them. Since the article only referenced Fish Creek and I liked the hike so much I thought I’d go back and revisit it for a new article about the hike. This time on the hike in, because of nature’s timing, I was blown away by the variety of butterflies I saw. 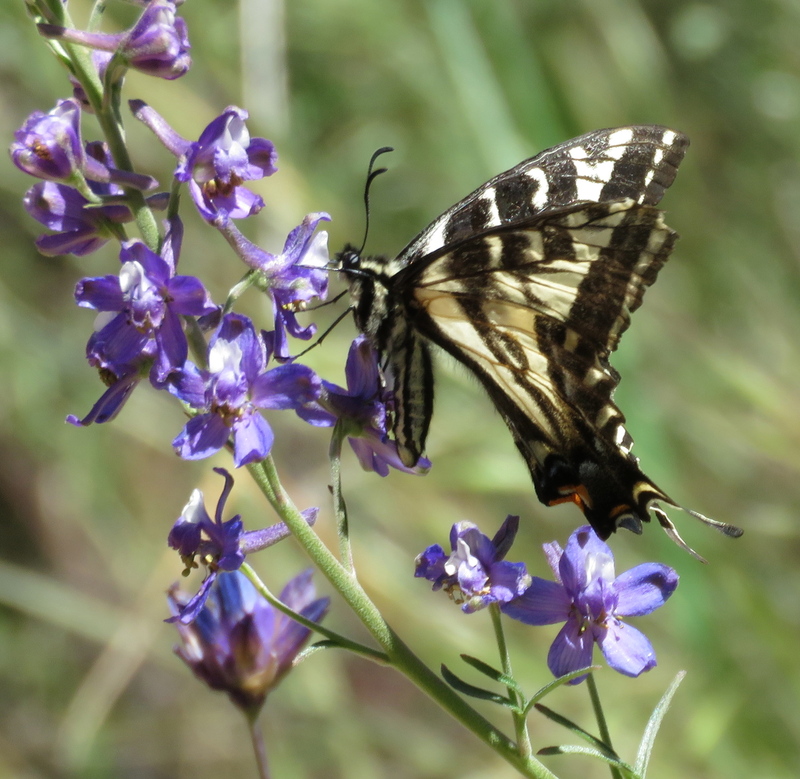 I often see a lot of butterflies in the springtime along Manzana Trail heading up towards the Narrows. 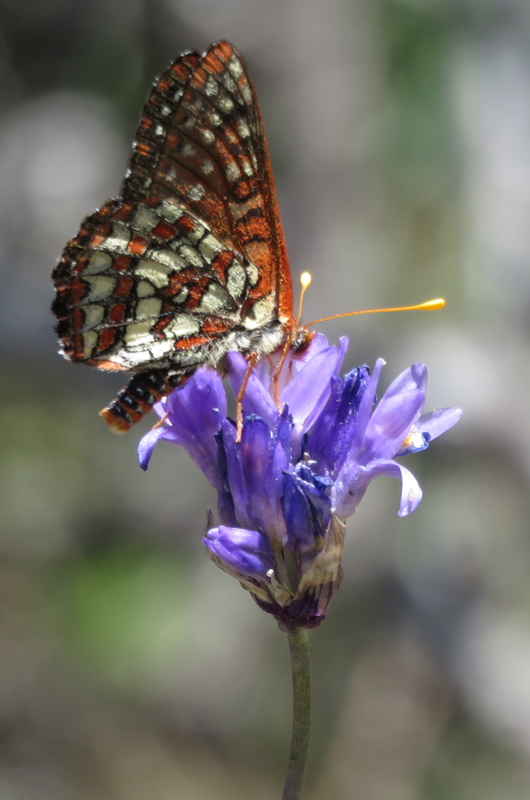 But what I mostly see is checkerspot and maybe a couple others all enjoying the yerba santa, which is in bloom. This time, however, it was like the butterfly equivalent of a “superbloom” with such a rich variety of butterflies that I found myself regularly stopping and photographing each different one I saw. When I got home I tried my hand at identifying them online, but what I really needed was field guide for our local area. Fortunately, I was able to track down a regional guide, which I highly recommend, An Introduction to Southern California Butterflies by Fred Heath. Hey Allan, fun running into you out there in the wilderness. Looking forward to this Sunday’s event at La Casa de Maria.